For the past 30 years, the East Akron Neighborhood Development Corporation (EANDC) has been bringing revitalization home to Summit County. 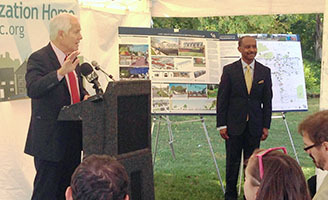 On Sept. 25th, EANDC broke ground on Robinson Homes East, a 27 single-family-home development. This will be central to the East Akron Neighborhood Revitalization Plan that will include housing rehabilitation efforts and vacant lot reuse. “Since 1982, EANDC has worked successfully to strengthen the Akron-area by rebuilding neighborhoods, protecting property values and allowing residents to achieve the American dream,” said EANDC Executive Director, Grady Appleton.